Apple has announced the launch of the 2nd generation iPhone, the 3G iPhone. 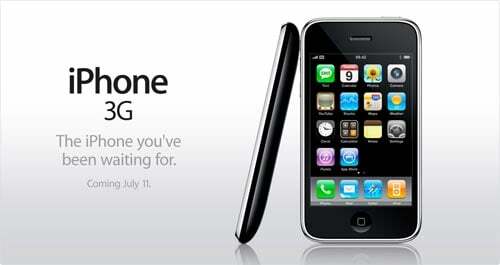 The 3G iPhone will launch Worldwide on the 11th of July 2008. Introducing iPhone 3G. With fast 3G wireless technology, Maps with GPS, support for enterprise features like Microsoft Exchange, and the new App Store, iPhone 3G puts even more amazing features in your hands. And just like the original iPhone, it combines three products in one ” a revolutionary phone, a widescreen iPod, and a breakthrough Internet device with rich HTML email and full web browsing. iPhone3G. It redefines what a mobile phone can do. Again. The new 3G iPhone will come in 8GB and 16GB versions, and will retail in the US for $199 for the 8GB version and $299 for the 16GB version. The 8GB version will come in black and the 16GB version will come in a choice of white or black. I have just spoken to Apple and asked them if they could confirm what the UK pricing would be, at the moment the price hasn’t been decided yet so I guess we will have to wait and see. I did ask what would happen to existing iPhone users here in the UK if they wanted to buy the new 3G iPhone, Apple confirmed to me that the new 3G iPhone could be added to your existing contract with O2 in place of your current one, so at least you don’t have to take out a new contract. Hopefully, the pricing will be similar to that in the US which would translate to £100 for the 8GB version and £150 for the 16GB version, it certainly will be a lot cheaper than the £269 I paid when they were released here last year.